The first aspect to consider when selecting a laser is robot behaviour and its environment. If the laser is to be used for obstacle detection on a moving robot, update rate and range are critically important. For example: A robot traveling 2m/s (or 4.5mph) would need a laser that can see at least double that range, at a refresh rate of 10Hz or greater. This would allow the sensor to detect an obstacle far enough away for the robot to stop prior to hitting the obstacle. Conversely, if the laser is to be used just for mapping or data collection, then update rate is less important, and precision over long ranges is required. Is the robot dangerous enough (fast or large) and in an unsupervised space with humans? (You likely need safety sensors then). Broadly speaking, lasers fall into two categories; indoor and outdoor lasers. Able to cope with dust and grime on the lenses a bit better than indoor lasers. This is usually done by sending multiple pulses at slight increments, and filtering the returning data to subtract dust, etc. Usually significantly more powerful than indoor lasers, to cope with increased noise (I.E. the sun) in the environment. On the other hand, indoor lasers tend to be smaller and less expensive than their outdoor cousins, while using less power. Another important aspect to note is that, currently, only indoor lasers have safety rated versions (more on this topic below). We tend to use outdoor rated lasers in our applications. Lasers can also be grouped into another two categories: Single beam (2 dimensional) and multi-beam (3D) lasers. Multi-beam lasers tend to be constructed of an array of single beam lasers, pointing at different vertical angles. However, other types of lasers exist, such as the new Cepton lidars. These focus on providing very high detail in a smaller field of view. Multi-beam lasers are advantageous as they provide more data for a robot about its surroundings. This can help a robot avoid obstacles that would otherwise be too low or too high for a 2D laser to see. Multi-beam laser data also consumes much more processing power. However, single beam lasers tend to be less expensive and smaller, while using less power. Once again, currently only single beam lasers have safety rated versions. In discussing safety rated lasers, we are talking about lasers that are designed to guarantee functionality to some level. We are not talking about safe to use around humans, though the vast majority of 2D and 3D lasers are safe to use around humans (this is usually accomplished inside the laser by ramping up emitter power until a return is detected. In this way, close objects get the same level of laser energy as far away objects). Safety rated lasers are usually rated on the PL scale (Performance Level) and SIL (Safety Integrity Level) scale. The PL scale goes from a to e, with a indicating a laser that has at most a 0.01% chance of failing, and e being a 0.00001% chance. 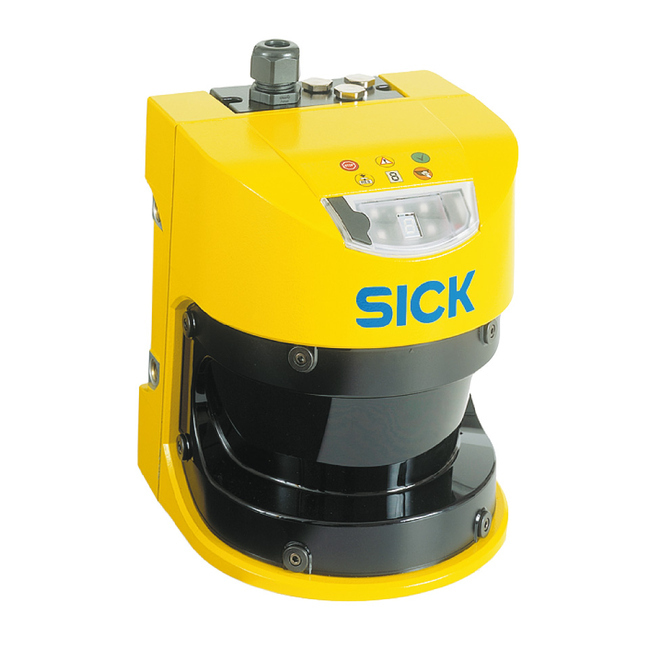 An example of a PL rated laser is the SICK S3000, with a rating of PL d. The SIL scale operates on a very similar principle, with SIL1 being less assured than SIL3. If the robot is dangerous and/or in close proximity to humans, and is likely to be left without human oversight, then safety is suggested. Safety lasers will also often have programmable interlocks, which will trigger a behaviour once an object approaches too closely. These can be used as automatic emergency stops for robots, disabling movement. Of course, some materials will be very poor reflectors of light (in an extreme example, Vantablack would probably never show up at any distance). Glass is a common element that most lasers have a hard time seeing. Surprisingly, dark blue jeans are also somewhat hard to see for lasers. This means that a safety margin should be built into distance limits for safety settings, because detection at the expected distance is not always guaranteed. Also, with safety rated lasers on the market today being 2D, ensuring that potential obstacles are in the laser’s field of view is difficult. A common solution is to mount the laser as close to the ground as possible, ensuring detection of feet, humans lying down, etc. The inherent trade-off there is, of course, that the lower you go, the more likely small obstacles and imperfections in the floor will cause false emergency stops. Keep in mind that sensor manufacturers are in direct competition with each other. This means specifications can sometimes be put on a slightly over-optimistic spin. For example, range specifications are sometimes measured using retro-reflective targets, which are far easier to see than real world objects. A decent rule of thumb is to halve the quoted range. At this distance, you’d be fairly certain of getting a good reading on any object. Other values are also sometimes over-quoted, such as having a 4 beam laser specified as “50Hz”, however each element only updates at 12.5Hz.